All Puppy Patch Australian Labradoodle puppies are $3,000 (plus 12% tax). A deposit of $500 is required to hold a spot on any of our waiting lists, which usually range from two to four months. If you are interested in purchasing one of our special doodles from our Puppy Patch, please fill out our application. After your puppy application is approved, please submit a non-refundable deposit of $500 to hold your reservation spot. Once your litter is born, I ask for an additional $500. Both the deposit of $500 and the $500 given at the time of puppy birth will be deducted from the final purchase price of $3,000 plus 12% tax, which is due when your puppy is 6 weeks of age. The applicable 12% tax will be applied to the final payment at 6 weeks of age. 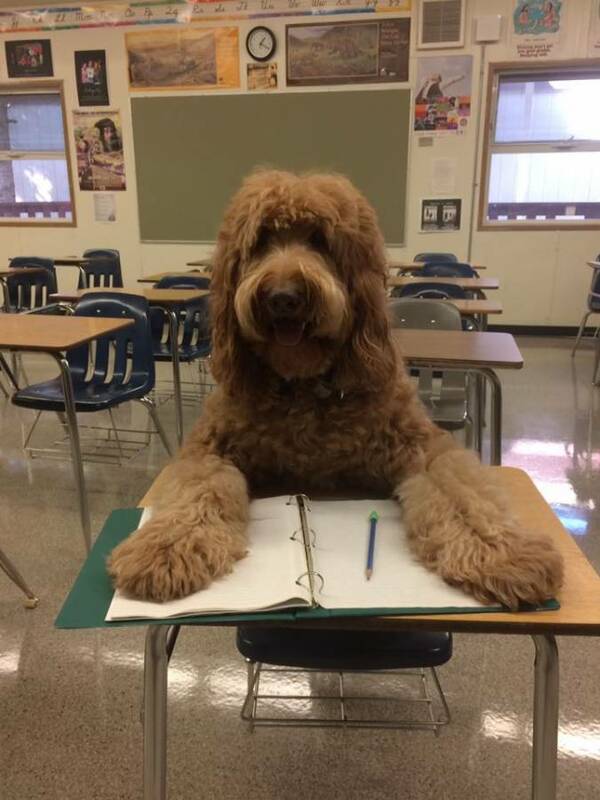 When your payment is received, you enter into a binding contract with Puppy Patch Labradoodles which will spell out all agreements between seller and buyer, and will provide for the protection of the buyer, seller, and the puppy. Methods of Payment: We accept E-Transfers, money orders, or PayPal payable to Annette Cameron. Located in Kelowna, British Columbia, we are within easy driving distance of all of BC and Alberta. We are able to ship puppies throughout the US, Canada, Europe, Asia. However, for Europe and Asia we prefer to send the puppy in cabin as carry on. Shipping costs are not included in our prices. Please contact us for more information about flying your puppy home. We can often travel to Vancouver and Prince George for a fee of $150. We may need to bill some transportation costs accordingly which may require transportation to and from the airport, vet certified health certificate, other necessary documentation, and an airline approved crate. All of our breeding dogs live in a loving home, rather than in a kennel. Some of our dogs live in Guardian Homes, whose owners raise and love our dogs during their breeding careers. After the dog is retired, the Guardian Home becomes its “forever home”. All our breeding dogs and puppies have received the best of care, including excellent food, a ton of attention, proper exercise, and probably the warmest spot at the foot of the bed! Each of our puppies has been exposed to young children and other dogs. I like to introduce them to a variety of different thing to better prepare them for their forever home. This also helps me to determine which puppy is best suited for you and your family. To help me place the puppy with the owner/family I look at the puppies personality, whether he is out-going or calm, coat type, colour, and size. Each of our puppies comes to you having slept in a crate at night for at least one week, and having been introduced to the basic concepts of potty training (clean environment, outside to potty in the morning, before and after naps, and at bedtime). And most importantly – A lifetime support for the life of your puppy!! By 7 weeks, puppies are matched with their families based on preferences written on your application, emails and photos exchanged, and telephone conversations. 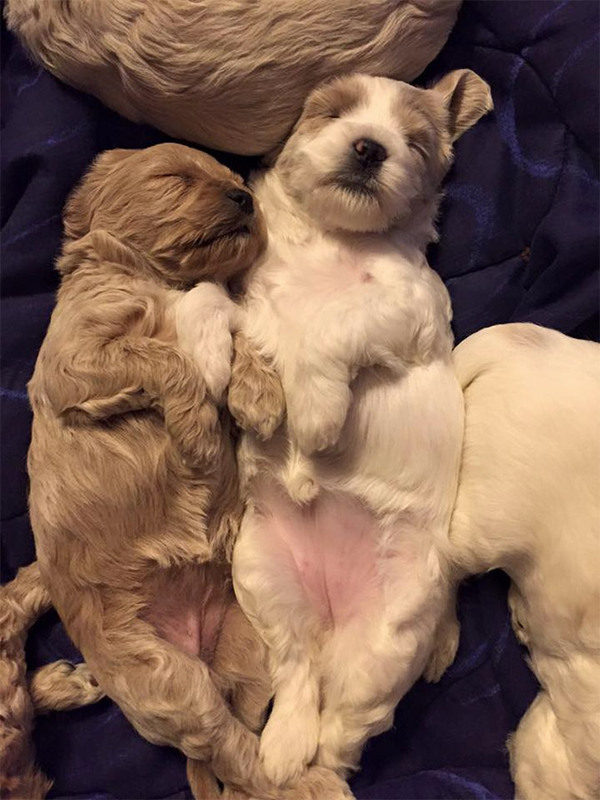 Puppies are matched in the order that deposits are received. Of course, we want the best fit for our puppies and your family, occasionally, we may need to forego immediate placement of a puppy if we feel there is not a good match for you in the current litter. On the other hand, if the timing isn’t right for you and your situation, you may request your deposit be moved to a different litter. Although rare, we also reserve the right to refund deposits if for any reason we are not comfortable placing a puppy with your family. We require first rights to purchase a dog back if for some reason you are unable to keep the dog. 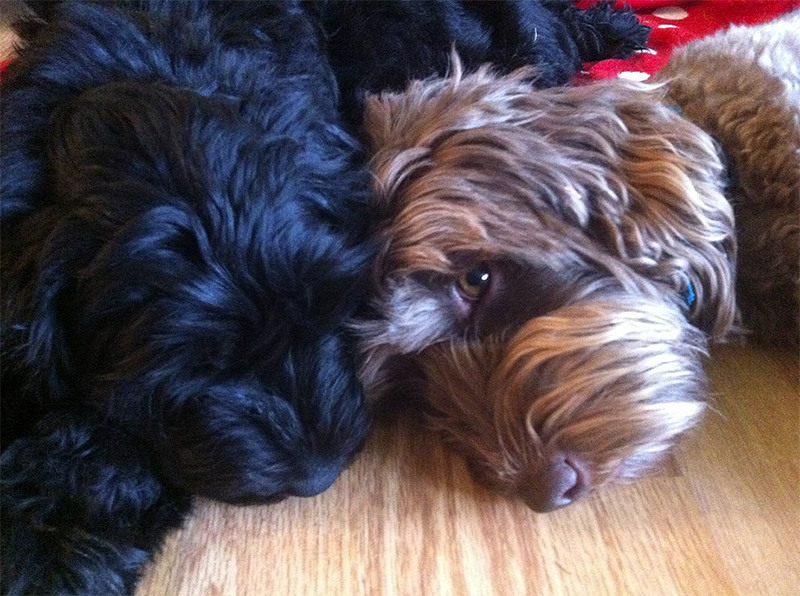 Puppy Patch Labradoodles has the right to retain any puppy for its breeding program, and so it may be that not all puppies in a litter are available as pets. 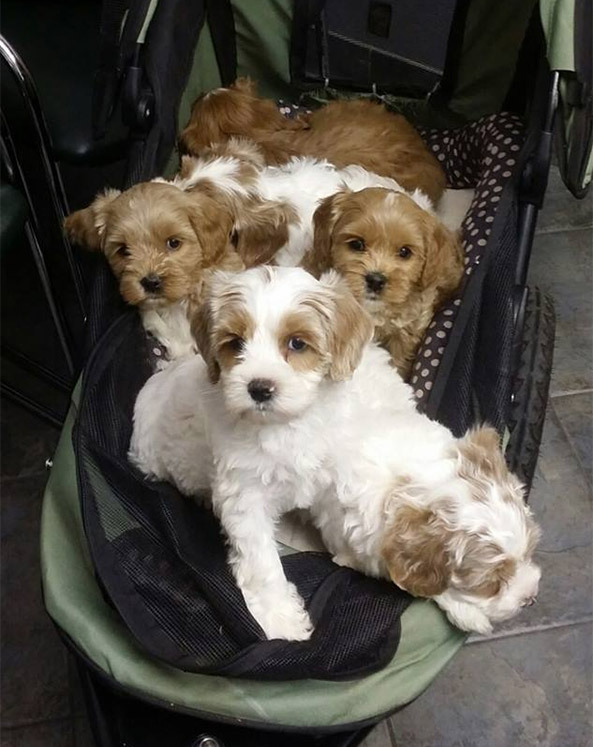 At 7.5 weeks, puppies are microchipped, vaccined and spayed/neutered. Puppies are ready to go to their forever homes at 8 weeks, after a checkup at our veterinarian’s office and veterinarian health certificate, if flying. 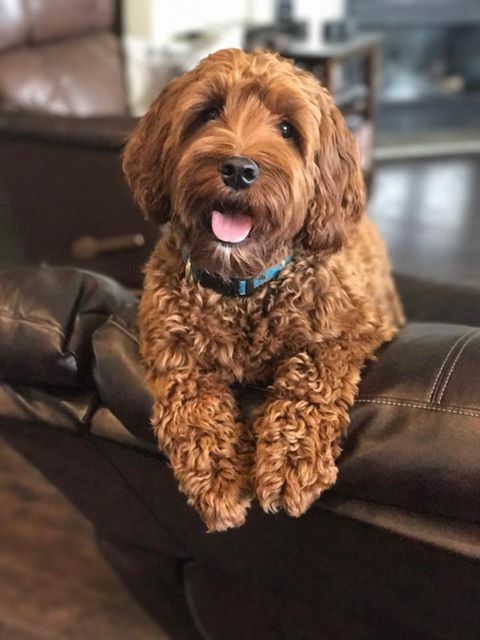 You are always welcome to email me at puppypatchlabradoodles@gmail.com to ask questions about the breed, puppy care, our breeding program and about how we select puppies for our adopting families. I often have people asking about coming to visit my facility to meet my breeding dogs or puppies. This is what I would want to do if I were buying a new puppy… a new family member. But there are many things to consider as a breeder that many people don’t realize. The dangers of exposing young puppies that are not vaccinated is very serious and can be detrimental to a breeding program and the welfare of my dogs. Visitors can (of course unknowingly) bring diseases onto the property and harm puppies. This is our home, not a storefront. I have a life outside of puppies so please be considerate of my schedule, my time, and the safety of my dogs when asking to visit. A little story for example… Parvo is a very deadly disease that any dog can carry but because they are vaccinated they are not affected with the disease. So let’s say that an affected stray dog is walking along the grass at Walmart and poo’s on the grass. Then a year later you come walking to Walmart and your flip flops step in the area where that dog went potty a year before. Then… let’s say two months later you wear those flip flops to my farm where my newborn puppies are not vaccinated for Parvo yet…YUP YOU GUESSED IT, my Mama dog could carry that disease to her puppies whose immune systems have not yet matured and are now at great risk of contracting parvo and dying. I allow visitors ONLY when I do not have puppies that are under 5 weeks old and vaccinated with Parvo/Distemper. All visitors will be required to an appointment. All visitors will wash their hands before handling dogs or puppies I ask that visitors wear clean clothing and do not visit my facility after visiting another farm or pet store. I am always happy to show off my dogs, meet new people and have visitors here. I do feel it’s an important part of purchasing your puppy and feeling comfortable with me as a breeder. Please be flexible and work with me when you want to visit because if it was YOUR puppy you would want me to take the same precautions.